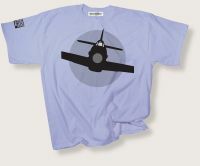 Sleeveprint: "So much owed by so many to so few Battle of Britain 1940"
75th anniversary special offer - £3 Off - Just £19.99. Usual price £22.99 thereafter. The Spitfire was without doubt the most memorable aircraft flown by the RAF in World War Two. The Spitfire Mk 1 was in service throughout the Battle of Britain, gradually replaced from August 1940, at the height of the battle, by the faster and more powerful Mk II, a fighter aircraft that was superior in every department to anything that was flying at the time. Sleek and swift, manoeuvrable, strong and well constructed Philosophy Football's graphic T-shirt pays 75th anniversary tribute to this defender of our freedom from Nazi Germany. Unisex sizes small (36inch chest/90cms),medium (40inch chest/100cms), , XL (48inch/120cms) and XXL (52inch/130cms). Available as listed in drop down menu below.